When I hear the name Angelina Ballerina the little mouse in a tutu pops right into my head from memories of watching my sister watch the show and seeing a couple of her books lying around the house when I was growing up. Since I was almost a teenager when Angelina Ballerina became a tv show I never really got into it but now that I have a daughter and some of the shows are on Netflix we watch them occasionally and my daughter really seems to like the shows especially when they play music and dance around which is most of the time. 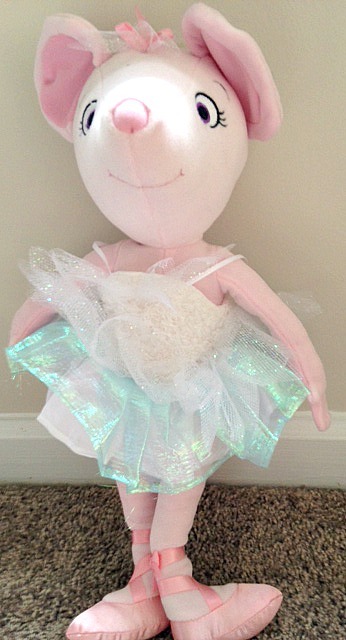 This past week we got the swan lake Angelina Ballerina doll from Madame Alexander. It is a very cute doll with a cute ballet outfit. It is a stuffed doll so there is a very good chance that my daughter will not be able to break it unless she becomes super strong and can tear fabric with her hands. Besides the pretty dress it is just a normal stuffed doll for your child to love and play with. This week is the start of national dance week (April 25-May4) and in honor of that and Madame Beatrice Alexander’s (the founder of Madame Alexander) memory the company is having a giveaway and there will be a winner chosen once everyday. The prize is an Angelina Ballerina doll, a book and DVDs. Also for this week they have sent along a 20% discount code just for our readers that they can use on the entire Madame Alexander website and the code is DANCE . Good Luck and happy National Dance Week! My niece will love this!! I would absolutely love to win this for my little girl!! She’s a huge fan of Angelina Ballerina!!! Thanks for the chance!! I would absolutely love to win this for my little girl!! She loves Angelina Ballerina!!! Thanks for the chance!! this would be great to win. thank you so much for the opportunity. My daughters birthday is Saturday! I know my little ballerina would love this!! My daughter would be think this win would be simply delightful.